Sunshine and a few clouds. High 94F. Winds NW at 5 to 10 mph..
On Tuesday December 27, 2016, our beloved Marnie entered eternal life in the comfort of her own home, surrounded by the love of her two daughters. Born on January 16, 1951 in Glen Ridge, New Jersey, Marnie soon thereafter returned ‘home’ to the Bay Area to join five generations of Californians. Settling into Orinda, Marnie attended Miramonte High School, graduating with the class of 1969. She went on to earn her Bachelor’s degree from the University of California at Berkeley, majoring in Psychology and Anthropology, two subjects she applied actively throughout her life. Marnie was known for her vigor for life and human interaction, which she exemplified throughout her professional career. In 1974 she joined Trans World Airlines (TWA), where she met the father of her two daughters and spent a decade leaving imprints on world travelers. Marnie spoke fondly of her flight attendant years, often reminiscing about her travels and lessons learned from around the world. Realizing the value of a global perspective, Marnie later made it a priority to expose her daughters to travel and adventure. In 1991 Marnie moved to St. Helena with the two lights of her life and spent the next quarter century becoming deeply ingrained in the fabric of her community. From school volunteer, to Girl Scout Troop leader, to sitting member of St. Helena’s Soroptimist, Marnie devoted herself to serving her daughters and the community. Among her wide variety of jobs, she took most pride in her role as an emergency crisis interventionist with the Napa County Suicide Crisis Hot Line. As a sales associate at Steve’s Hardware, she applied her love for ‘fix it’ projects and conversations with grassroots clientele, and as owner of Crush Women’s Fitness, she sought to improve the health and self-image among women in the area. 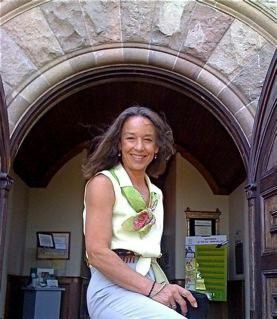 Her career culminated as head of concierge at the Culinary Institute of America (CIA), a role that brought together her life’s passions: she gave voice to the history of her beloved Napa Valley, conversed with world travelers who entered the Greystone doors, and offered her supportive, motherly touch to the CIA student body—many of whom described her as their home away from home mom. In 2014 Marnie was honored by St. Helena’s Chamber of Commerce as Employee of the Year. Despite the pride and joy she received from each of the roles she played throughout her life, she always said her most cherished was the role of being a mother to her daughters, Elizabeth and Erin. Marnie was committed to family and tradition. She had a love for the outdoors, for the pure innocence of children and animals, for meaningful conversations, and for great music and dancing. Like her mother, a sports fanatic, she planned her nights around watching Giants, Warriors, 49ers and Cal Bears games. Marnie’s physical presence will be missed by so many, but her legacy lives on through all the people she touched. Marnie is survived by her two daughters, Elizabeth and Erin Sullivan and by her siblings, Anne Meinert, Bill Cunningham and John Cunningham. A celebration of her life will take place on Saturday January 21, at 2pm at the Native Sons Hall in St. Helena. In lieu of flowers, the family has requested donations be made in Marnie’s memory to The National AIDS Memorial Grove or St. Helena’s Rianda House.